Scripture Memory Fellowship's mission is to cultivate systematic Scripture memorizers who know Jesus Christ and grow in His likeness for the glory of God. 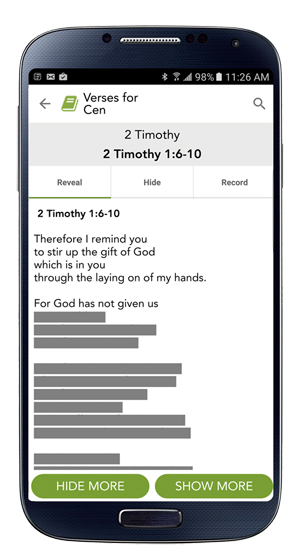 We do this by offering printed, digital, and musical Bible memory tools for every age group. We also promote live events, such as Scripture Memory Camp and Scriptorium, to cultivate the habit of obeying, the heart of understanding, and the art of presenting the life-giving words of God (Ezra 7:10; John 6:63; James 1:22). Scripture Memory Fellowship was founded in 1977, utilizing the same materials developed for Bible Memory Association (BMA). Based in Texas, SMF operates primarily for North America but has partners in Spain, Indonesia, and beyond. Inspire enthusiasm for the surpassing value of God's Word. Kindle motivation that overcomes all objections and obstacles to memorizing Scripture. Model memory work by being the memorizer we want others to be. Invest in relationships that encourage memorizers with accountability, recitals, and rewards. Co-labor with sister ministries that share our purpose of planting God’s Word. Jim has been memorizing Scripture his whole life, but as a teenager, 1 Peter 5:7 awakened him to the the beauty of Christ's love. As an adult, Jim served as a pastor in Hannibal, Missouri for 12 years before becoming SMF's full-time executive director. His responsibilities are wide-ranging and include program development, ministry promotion, and strategic planning. Jim is happily married to his wife, Susan, and together they enjoy their three children: Faith, Jonathan, and Mary. Jim's father, Dr. N. A. Woychuk, founded SMF's parent ministry (BMA) in 1944. Laura has memorized Scripture since early childhood, participating in AWANA, Bible Quizzing, and the National Bible Bee. A homeschool graduate, she went on to earn a Bachelor’s in English from Thomas Edison State College. As SMF's full-time office manager, Laura oversees the administration of day-to-day operations such as order fulfillment and newsletter mailings. She also contributes to the development of new SMF programs and resources. Laura is married to fellow staff member Dakota Lynch. Dakota started memorizing in 9th grade after realizing that Scripture memory deserved to be a priority in his life. Some of his favorite memory passages include James 1:17, 1 John 3-4, and Romans 12. As SMF's full-time IT & Communications Manager, Dakota is responsible for the maintenance and development of SMF's mobile apps and scripturememory.com. Graphic design, content composition, and pre-press formatting are also among his job responsibilities. Dakota is married to fellow staff member Laura Lynch. Phil's life was transformed by the words of Galatians 2:20--"I have been crucified with Christ; it is no longer I who live, but Christ lives in me; and the life which I now live in the flesh I live by faith in the Son of God, who loved me and gave Himself for me." With his wife Jacky and four lovely children, Phil's passion is to spread enthusiasm for the Word of God among Bible College students in Indonesia, the Philippines, India, and beyond. Scripture Memory Fellowship is a work of faith. Support from God’s people allows us to continue operations and to offer materials at low cost. God has faithfully supplied SMF’s needs for 40+ years through the sacrificial giving of His people. If you’ve been touched by our ministry and/or want to support this work of planting God’s Word, please prayerfully consider giving (Rom. 15:27; 2 Cor. 9:7).